Dette to-værelses 50m2 og passage er ideelt beliggende i den gamle Antibes på Massena kurset. Til dig, den venlige atmosfære og autentiske provencalske marked, besøger Picasso-museet, gå langs voldene, stranden i Gravette og Salis, alle er inden for gåafstand. Op til 4 personer, denne lejlighed er på tværs og meget komfortabel: rummelig stue fuldt udstyret med sovesofa, klimaanlæg, termoruder, gratis wifi, TV, lagerplads, badeværelse med badekar. We simply loved our week in Antibes at Gillian’s lovely apartment. It was so comfortable and well equipped, and the central Location made becoming a ‘local’ quite easy. We loved having the market nearby for fresh food and the bar downstairs was a blast. Nearby parking also made it easy to have a car for exploring. We can’t wait to return. This apartment is in a lovely position right in the centre of old town Antipes. 100m from the Picasso museum, 200m from the marina and 20 metres from the fresh food market. The accommodation is full of old town charm with a modern decorative feel. All modern white goods and large tv are fitted and the bed is comfortable but the bathroom is a little small but adequate for a weeks stay though. We spent the four days we were in Antipes within 500 m of the apartments loads to do and numerous restaurants from the small to the Michelin starred. We will definitely return. Enjoy your stay you will not regret it. The amenities and location where excellent. The owner was above and beyond helpful. Great holiday! In the heart of old town Antibes. Wonderful apartment. Gillian and Fanny were super helpful. Highly recommend. Great holiday! Cet appartement est très agréable à vivre et merveilleusement situé. Agréable car il dispose de tous les éléments de confort et est décoré et équipé avec beaucoup de goût. Il est spatiaux, bien agencé. Tout y fonctionne bien. La chambre, à l'arrière, est tout à fait au calme. Très bien situé, car au coeur du vieil Antibes. On ne saurait faire mieux, puisque la fenêtre du séjour donne sur le Marché Provençal. Et à 50 m, on peut visiter le Musée Picasso et de promener sur les remparts. Tout autour les rues charmantes de la vieille ville avec de nombreux restaurants et boutiques originales. Et finalement, on peut garer sa voiture à 5 mn à pied, tout en payant une somme très raisonnable, si l'on choisit le forfait. Thank you Gillian and Daniel for our stay in your appartment :-)! 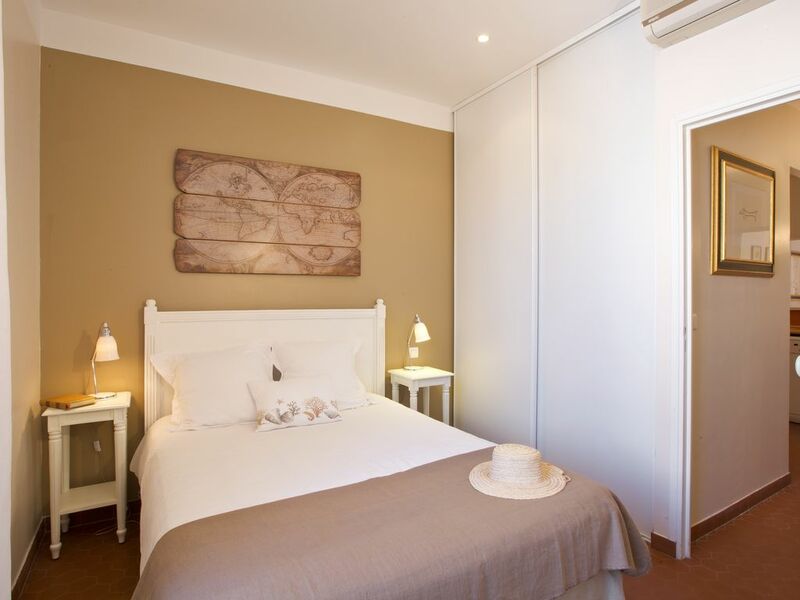 Perfect location right next to the market giving the perfect atmosphere for a family vacation in Old Town Antibes. Spacious for our family of 3, with one 7 year old boy. Clean and well equipped. Close to the nice and kids friendly beach Gravette. Lots of good restaurants nearby. Thank you for all the hospltality ! We would love to come back. Thank you for being such perfect guests! It will be with great pleasure to welcome you once again. I spent a month here at Gillian's charming apartment. Everything was as promised and more. The apartment is larger than appears on the photos. The bed is very comfortable. The kitchen is well equipped with everything you would need to make dinner including a nice selection of dishes and serving pieces. The market is visible from the window and the view out is beautiful old Antibes. The location can get a little noisy but the windows eliminate most of the noise. The bedroom is above the trash containers in back and the pickup can be loud in the middle of the night but the windows dull that considerably. I spent a month there and didn't need either air conditioning or heat but the apartment has both. I wouldn't hesitate to stay here again. I loved my month in Antibes. We ask for a deposit of 30 percent at the time of booking. The balance is to be paid one month before arrival date. Security deposit taken on arrival of 500€. We accept french cheques, bank transfers and paypal. However all paypal and bank charges are to be paid by the guest . There may be an extra charge for late arrivals and early departures. There is a local tourist tax of 1,50 per adult per night to be paid on departure. There is a end of stay cleaning fee of 50 euros.